The existing colors will not be edited with this option. 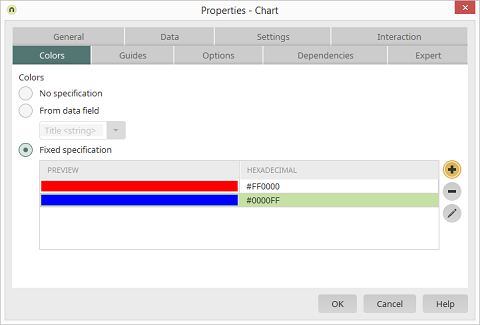 A data field can be selected that contains a hexadecimal color value. If, for example, all of the bars in the diagram for Employee A should be shown in green, the hexadecimal value for green needs to have been entered for every data record created for this employee. The colors listed here will be used one after the other for the row element of the diagram. A preview of the color is shown here. Shows the hexadecimal color value. Opens a dialog where a color can be selected. Removes the currently highlighted color from the list. Opens a dialog where colors can be modified.